When people complain about development that adds more homes and people, or push absurd ideas about closing the Front Range to newcomers, here’s something to keep in mind: A lot of Denver’s neighborhoods were denser in 1950 than in 2010. According to new data out of the city’s Denveright planning initiative, more people lived in many downtown and near-downtown neighborhoods in the 50s — including fast-developing places like the Central Business District, Capitol Hill, Highland, Jefferson Park and part of Five Points — because Denver’s streetcar system and land use allowed it. More homes and destinations closer together meant more people could easily walk, bike, or ride transit where they needed to go. When city and state decision makers began planning almost solely for private automobiles and building the enormous highways and parking lots needed to accommodate mass motoring, the streetcar system was decimated. Walkable neighborhoods declined as city dwellers fled to sprawling suburbs. In other words, for example, there’s no conspiracy to “take” on-street parking spots from people by adding homes without dedicated parking spaces. Adding homes and more transportation choices is a logical move for a growing city trying to make room for more people. 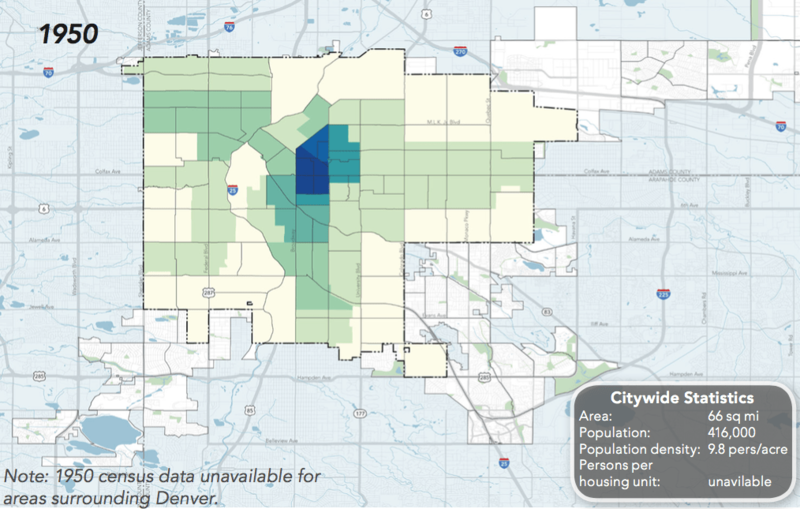 Denver has accommodated higher densities before, and it can do so again. Gaspers and CPD hope the revision of Blueprint Denver, the city’s land use and transportation plan, will shape development and transportation in a way that helps people live car-free if they choose to. Two major goals have emerged in the past six months: Improving the function of streets to move more people (as opposed to more cars), and location efficiency, or making places closer together so long trips aren’t necessary. Family sizes shrunk. Two 1950’s households with three people each would likely be roughly three households today with two people. Even if population doesn’t grow at all (in Colorado, lol…), housing demand will still grow.